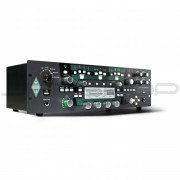 Contact us to get an even better deal on Kemper products! Trade-ins welcomed! 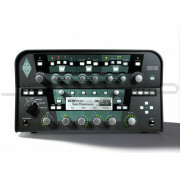 The Kemper Profiler PowerHead is an entirely new and groundbreaking concept for guitar amplification. Finally guitar players are able to easily transfer their signature sounds into a conveniently sized box and take them anywhere: to the rehearsal, into the studio - and most important of all – on stage. For your convenience, the KPA comes loaded with 199 factory profiles created by top engineers and producers in premiere studios around the world. The Kemper Profiler PowerHead adds a built in 600 Watt power amp to the Kemper Profiler concept and turns the former recording solution into the most versatile guitar amplification system ever. Utilizing the Kemper CabDriver mode, guitarists now have the choice of playing through regular guitar cabinets or full range monitor systems. This extends the Kemper Profiler concept as the perfect solution for the rehearsal room and the stage. The 600 Watt Class D amplifier was carefully selected for the guitar amplification system to guarantee utmost performance. After extensive listening tests, a lot of measuring and looking thoroughly at the typical sonic behavior of power amps for guitar amplification on the market, it became clear that only the best components are capable of delivering impressive results. The Amplifier delivers 600 Watts at 8 Ohm, 300 Watts at 16 Ohm, does not heat up (temperature can be monitored on display) and is lightweight. 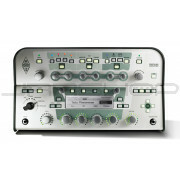 The Kemper Profiler digitally captures the sonic fingerprint of virtually any guitar amp. The days of struggling to reproduce that magic mic position in front of the speaker cabinet are over. Now you can have a profile for every combination of tones and settings your tube amp setup provides. The Kemper Profiler offers a convenient and accurate A/B comparison mode so you can be sure that all your profiles are just like the original amp. If you have used some great-sounding, well-maintained vintage tube amps in the studio, you can create profiles from these amps to use anywhere you like, at any time. Profiles can be spiced up with the Kemper Profiler's included professional quality effects; you can save variations with alternative amp settings, and you can exchange the cabinet simulation within a Profile at any time. Do you plan on touring? Simply dial up your Profiles from the studio session when you play live. Instead of having to risk bringing a truckload of rare and fragile vintage amps to the gig to get your sound, now you can profile your amps before the tour, and just bring the Kemper Profiler with you on the road! The Kemper Profiler gives you what generations of guitar players have been waiting for: the ability to have your sound anytime, anywhere. “Profiling” is what we have named our proprietary technology that captures the sound and feel of a specific tube amplifier. In other words, the Kemper Profiler doesn’t simply give you a list of static digital amplifier reproductions. Instead, profiling creates a vivid, living, dynamic and multi-dimensional image of your existing tube amp. Profiling is as simple as plugging your tube amp into the Kemper Profiler and pressing ‘record.’ Just insert the Kemper Profiling amplifier into the recording chain and it will do its magic. Test signals will be sent from the Kemper Profiler Amplifier into your tube amp and recorded by the microphone in front of your cabinet. You don’t even have to play your guitar. After less than a minute the Kemper Profiler acquires the sonic DNA of your tube amp and offers you the resulting custom profile. You can then use the A/B comparison mode to compare original tube amp sound with the profiled sound.This gives you a fast and convenient way to make final tweaks to the profile to get it exactly right. The Kemper Profiler includes the standard Gain, Bass, Middle, Treble and Presence controls that you would expect from an guitar amplifier. However, in contrast to many vintage amps, we have kept the gain control neutral, so you are able to find the sweet spot of your amp, and run this optimal sound at any gain level. The gain control ranges over 80dB and features an automatic volume compensation for clean settings. Now, imagine if you could change the sonic character of a profile way beyond what’s possible with the amp itself...What if you could change the sonic age of the amp, or the bite of the pick? What if you could modify the power supply of your profiled amp in order to benefit from power sagging or be larger than life? With the Kemper Profiler, you can! We allow you to dynamically adjust key aspects of your favorite amps which would otherwise be impossible or require hardware modifications. You can do anything from minor tweaks, such as making your Marshall Bluesbreaker profile sound a bit more vintage, to more radical changes such as adding some modern high gain chunk to your vintage Fender Bassman. The Amp Definition parameter determines whether the Profile leans more towards a vintage or modern character. Increase this parameter to intensify the touch response of the virtual tubes. Power Sagging: this parameter lets the tubes breathe with your playing; damped strings will have more ”chug,” and clean, picked notes will cut through better when you reduce your playing volume. The Pick parameter controls the attack of your pick independently of the gain setting—even through heavy distortion. This innovative parameter lets you decouple your pick sound from the natural compression of the distorting tubes and cut right through the mix. The Amp Compressor will sustain the clean guitar when you play soft, but lets the distorted sound through, unprocessed, when you revert back to normal playing volume. The Cabinet Voicing parameters give you access to the guts and the character of the cabinet. You can change the size of your virtual cabinet, tune the bass resonance or control the tonal character in an creative way.